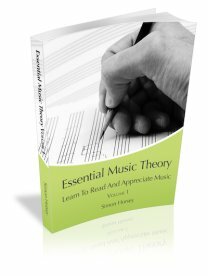 I'm working my way through 'Essential Music Theory' and it's been very good. 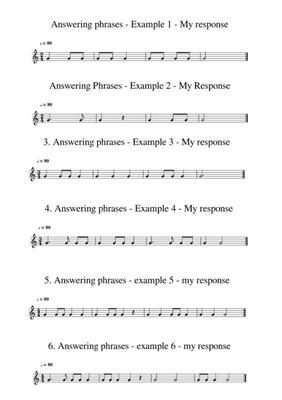 I've just done the exercise on page 54 where you complete the six musical phrases and was hoping to get feedback to make sure I'm on the right track if that's possible please? I've attached a pdf with the phrases. Thanks for your prompt feeedback Simon. Very much appreciated and it helped a great deal to know I'm on the right track. Looking forward to exploring more music theory in the current book and the forthcoming volume 2. Hi Nigel, these are great! You have balanced your phrases with the given phrases and also used longer notes at the end to make them sound finished. If there were one very small thing it would be that in number 4 in the last bar I might have put a dotted minim (dotted half note) at the end of a piece. However, if this were the first phrase as a melody I would have done what you did for rhythmic interest. As I said this is absolutely a tiny thing and yours is also perfectly correct (and a little rhythmically more adventurous which I like!). Good luck with the rest of the book. Looks like you are being very successful so far given these answers! P.S I am almost finished with book 2 for when you have complete book 1!